Creative environment for friends to discover their inner artist. A tour of our studio to learn how we glaze and fire your pottery! We'll provide the art supplies, you provide the guests. * Art projects must be determined at least one week prior to the date of your party. No more than 3 items for each person to choose from. You may also choose to set a price limit and allow your guests to pick the piece they like (price limit option recommended for ages 8 & up). 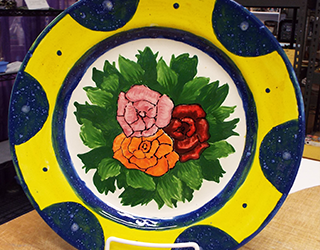 With tons of pottery pieces, and a wide range of paint colors to choose from, we have something for everybody and every age. We've got tons of tips, techniques, and tools to help you create a masterpiece! 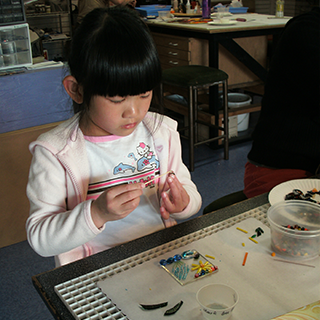 Glass-fusing is an easy, safe, and fun way to create your own art. Create votives, frames, mirrors, plates, jewelry, you name it! 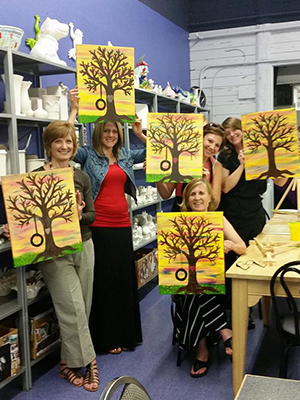 Super-popular, "Social Artworking" Canvas Painting, is the fun, new way to paint & party at the same time. Help children expand their minds. Great for Mother's Day, Fathers day, and holiday projects. Earn your pottery badge with a fun hands-on activity. Plus you get to create/paint your own piece to give as a gift or keep for yourself.